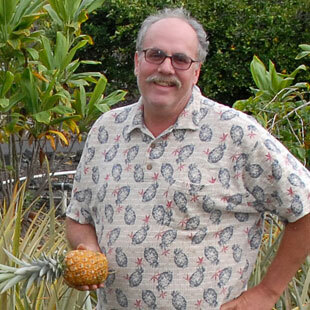 Ken Love cultivates his passion for pineapple on Hawaii’s Big Island. Hawaii’s “Pineapple Island,” Lana’i, was where I first visited a pineapple field. It was a sultry day. The heat rose from the red dirt in waves, making the pineapple leaves look like they were dancing the hula. I inhaled deeply, smelling the sweet fruit scent tinged with salty ocean air. I did a little dance myself, down those long rows of green and gold with the blue sky above. Funny what pineapple will do to a grown woman. Just seeing one makes me smile. It’s odd-looking, with that spiky crown and rough exterior. Pineapple seems tough to tackle, like the offensive lineman of the fruit world. But inside, it delivers nature’s best sugar rush, every time. I’m not the only one under its spell. Christopher Columbus first saw this New World fruit in Guadeloupe in 1493 and was so dazzled, he brought some back to Spain. Pineapple probably came to Hawaii via the Spaniards, who introduced it to the Philippines in the 16th century. “Pineapple has been a symbol of hospitality and friendship for centuries,” says Ken Love, president of Love Family Farms on the Big Island of Hawaii. Love has been growing pineapple (and other tropical fruit) for nearly 30 years. Middle-aged, tall, with thinning hair, he wears big aloha shirts and an even bigger grin. Love’s favorite white pineapple is hard to find on the mainland, where the gold variety is the primary one available. Luckily the gold pineapple is highly aromatic, has a gorgeous golden hue and is consistently sweet and juicy. It’s also loaded with vitamin C. “It’s got all the desirable qualities of an ideal fruit,” says Love. Love says pineapple, a member of the bromeliad family, which also includes Spanish moss, is easy to cultivate. “If the soil stays above 68°F, it grows anywhere, even in a pot,” he says. When working the fields, he often cuts up a ripe pineapple for a quick energy boost. Sometimes Love dons his other hat (culinary instructor and trained chef) with his wife Margy to make pineapple jams, jellies, fudge and sauces. Pineapple’s merits seem endless. Its versatility is astonishing, brightening global recipes like a 1,000-watt bulb. In Thai tom yum soup, for instance, pineapple adds vital sweetness, beautifully balancing the heat. And Caribbean coconut layer cake is like yin without yang until pineapple adds its sun-kissed bliss. In wintertime, when seasonal fruit choices can be slim, I turn to pineapple. Like a best friend, it’s one fruit I can count on. The sky may be gray and the trees barren, but when I eat pineapple, I feel the tropics. Food and travel journalist Janice Wald Henderson travels the globe, but has a special interest in Hawaii. She is a cookbook author and frequent contributor to national magazines. EatingWell in Season: The Farmers’ Market Cookbook. Copyright 2009 by Eating Well, Inc. Published by The Countryman Press, P.O. Box 748, Woodstock, VT 05091. It is prohibited to copy, redistribute or transmit this work for any purpose, commercial or otherwise, without the express written permission of the publisher.